On Friday 21st February 2014, Dr Henrik Schoenefeldt gave a presentation at Westminster on the Victorian ventilation system of the House of Lords chamber. It focused on the development of its design between 1840 and 1854 as well as its environmental performance. 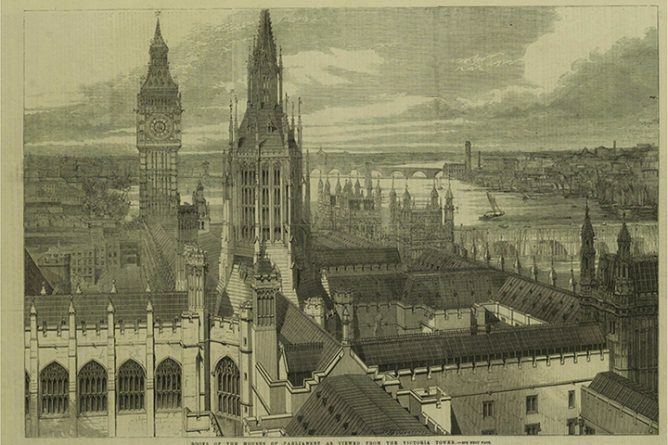 He presented detailed reconstructions of the Victorian system, which he had produced as part of his ongoing research into the Palace of Westminster’s ventilation system. It is the first study to investigate the design, historical evolution and performance of the system in full depth, combining archival research, drawn reconstructions and technical analysis. The historic system had fallen into disuse since the 1940s, when a modern mechanical ventilation and air-conditioning was introduced, but the objective of the current inquiries is to investigate the feasibility of re-utilising parts of the historic system through the development of a hybrid ventilation system, which combines mechanical systems with natural stack ventilation. This is to form part of the Palace restoration project. In the afternoon after the talk Dr Schoenefeldt and the chief environmental engineer Andrew Piper studied the surviving historic features of the system. Through Dr Schoenefeldt’s research it was possible to find many of the hidden historic features and he was able to explain the original function of these features. This involved climbing up into various air channels below and above the House of Lords, including the roof spaces, turrets and ventilation towers used for the extraction and supply of air. The two were able to uncover many of the historic features that are currently covered or bricked up, including the original perforated iron floor used to admit fresh air into the Lords chamber and the various ventilation grills in the walls and under the benches of the galleries. These are to be continued over the next few months and Henrik will be involved in a feasibility study of using a stack ventilation system that utilises large parts of the Victorian system. This presentation was a major milestone in Dr Schoenefeldt’s work on the historic system. Following the submission of a report to the House of Commons Commission in January 2013, which was based on the findings of research conducted by Dr Schoenefeldt over the previous two years, he was invited by the Parliamentary Estate Department to act as a consultant on the historic stack ventilation system. Since November 2013 he has been working on a study of the House of Lords chamber. In January 2014 he submitted a detailed report of this study and he is currently working on another study, focusing on the ventilation of the River Front. This will be the subject of another report, to be presented in Westminster in April this year. An application for a detailed feasibility study is to be prepared.